Pro-Relief’s Pro-Argin technology consists of an amino acid, arginine, and an insoluble calcium compound—calcium carbonate—to seal open dentin tubules and help block stimuli of pain receptors within teeth. Pro-Relief Desensitzing Paste can be used before or after dental procedures, such as prophylaxis and scaling. We first received samples of the desensitizing paste and had such great results we couldn't wait to order it. Application prior to the prophy really helps the sensitivity. I have had good success with this product. The patient's appreciate me being able to apply something quick and easy. They also say it tastes great. I appreciate the fact that it is easy to apply and is actually burnished into their root surface. It doesn't hurt that it isn't messy, either. I use this paste before scaling on anyone who has cold or root sensitivity. It works great on many cases to help the patient relax so he/she isn't so jumpy when scaling. Great product! Patients get relief quickly and easily. Simply polish on and have patients rinse. Patients can tell a difference at that first rinse. Only drawback if it comes in contact with saliva or you overload prophy cup(more than half) this stuff easily splatters and flies everywhere!! I have used Pro-Relief many times befor and I have had patients request this product at their appt. The taste in enjoyable, less splatter, and a great consistancy. Yet again, Colgate has come up with a product that is enjoyable for everyone with sensitivity issues. 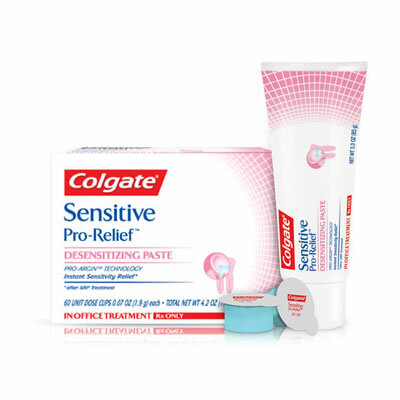 I reccommend Colgate Sensitive Pro Relief to anyone and everyone! Finally a desinsitive product that goes on smooth without the sting that other products have and it does not leave an after taste. Patients actually enjoy the polishing treatment in office. And they are happy to follow through with the purchase of the at home treatment. Better at home compliance and and repeat purchase.